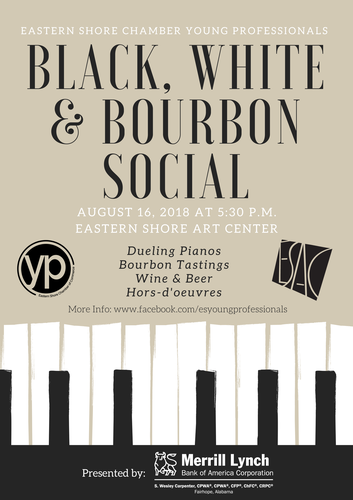 We are going all out for our August Young Professionals Social thanks to our sponsor Merrill Lynch - S. Wesley Carpenter, CPWA®, CFP®, ChFC®, CRPC®. We're bringing out dueling pianos with Scott Morlock and Tony Edwards. Big Escambia Spirits, LLC will have bourbon tastings. Fairhope Brewing Company will be providing beer and wine will be available. We'll also have hors d’oeuvres from Rae's Kitchen. Invite your friends and come to meet other fun young professionals in the beautifully renovated Eastern Shore Art Center. Do not miss this event! Young Professionals events are free to attend. This group is made up of 21 to 40-year-olds looking to make valuable connections here on the Eastern Shore. Thursday, August 16 5:30 p.m.
Young Professionals events are free to attend.